During their decline, the Roman Empire would surely have taken some solace in the fact that thousands of years later, their achievements would be immortalised in the form of online slots; Legions of Luxury is one more to add to the list, it’s developed by Random Logic and it comes with several features and a progressive jackpot. 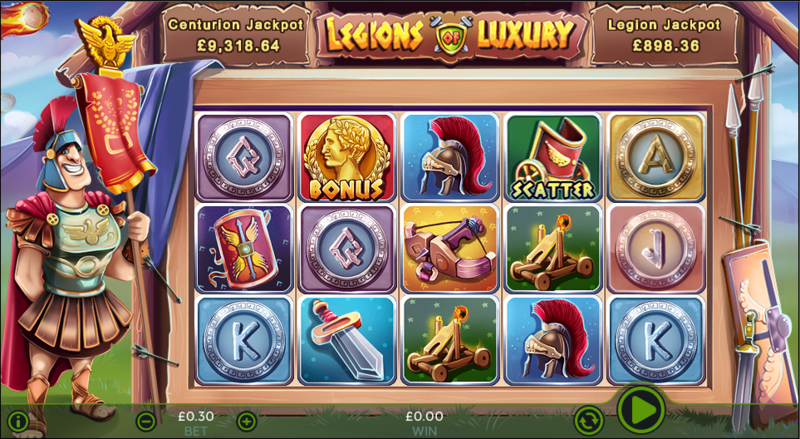 Legions of Luxury is a five reel slot with three rows and thirty fixed paylines; a cheerful standard bearer stands guard to the left of the reels which are dotted with arrows and fixed to the side of a wooden structure. The high value symbols include a sword, a shield, a helmet, a catapult and a trebuchet while the lower values are the standard 10, J, Q, K and A but in a Roman design. The wild symbol is the golden eagle and it will substitute for all others to create winning combos except for the gold coin andchariot bonus icons; the wild will also expand to fill all positions on it’s reel if doing do would create any more wins. Even better those extra wins will be subject to a 2x multiplier. This is triggered by landing three of the gold coin bonus symbols anywhere on reels two, three and four and you will get to play a four level pick-a-thon in which you collect multiplier values which will then be combined an applied to your total stake. 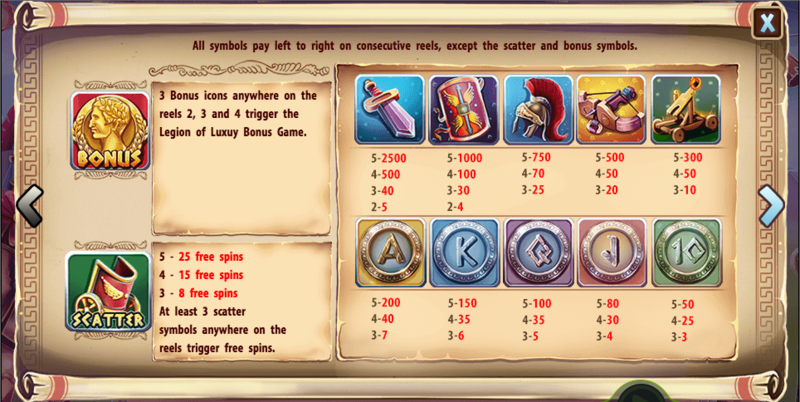 Trigger this by landing three, four or five of the chariot scatter symbols anywhere in view for which you will receive 8, 15 or 25 free spins respectively. There’s nothing extra going on here but the spins can be triggered again by landing more chariots. Land the wild symbol on reels one and five and you will get the chance to pick from the treasure chests offered for a cash prize; lucky players may be offered the chance to pick again. The progressive jackpot is awarded randomly in this game but playing with a bigger stake and more paylines will increase your chances. Legions of Luxury is a good-looking slot and one the Romans would surely have enjoyed; there are plenty of bonus features to keep things interesting, some cheerful graphics and a progressive jackpot to dream about. This game comes with an RTP of 96.03%.